AVATUS is an IP-based, modular audio mixing console system of advanced design for broadcast, theatre and live sound applications. Standard TCP/IP Ethernet network technology allows access to local or remote DSP resources and also interconnects console sections. The modular design allows total flexibility in hardware distribution and all components may be in any location, as required. All console functions may be controlled remotely from computers, tablets or other mobile devices. AVATUS is directly compatible with all major audio networking protocols, including AES67, Ravenna and Dante. The Stage Tec NEXUS routing matrix may form part of an AVATUS system; NEXUS is fully modular and can be configured with whatever mix of audio I/O formats is needed. The Stage Tec AVATUS is a powerful and advanced IP-based audio mixing console system for use in broadcast or large-scale live music production in theatres and arenas. The console itself offers unrivalled flexibility in user configuration. Any area of the surface may be assigned as required to be the master or monitor section and then returned to channel functionality, thus maximising the number of channel control strips for a given console size. Channel parameters such as EQ or dynamics are controlled using a per-channel bank of rotary encoders, while routing and most other channel functions are accessed through one of two 21” touchscreens. The upper touchscreen will normally act as the meter bridge, but the functions of the two screens may be exchanged: thus in performance, once the main channel settings have been made and do not need further alteration, the meters may be placed immediately in front of the operator. A particularly powerful feature of the control surface is allocation of colour illumination. 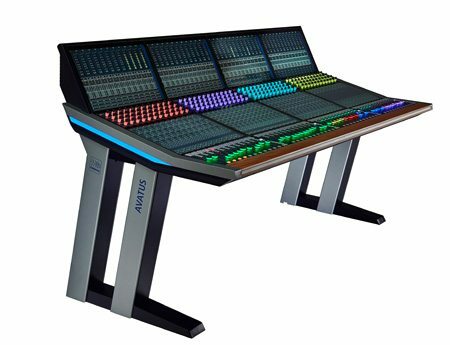 The user can assign any colour to each of the console‘s various logical functions – inputs, outputs, groups, VCAs, EQ, dynamics, etc., and the faders and other controls will adopt these colours as the workflow progresses, making identification quick and simple. AVATUS is compatible with major audio networking systems including Dante and AES67, and also with broadcast control protocols such as EmBER+, AES70, RAS, ROSS and Mosart among others. Connectivity to audio resources and between console components is entirely by TCP/IP via Ethernet, resulting in total flexibility of system topography. Multiple consoles of any size may co-exist on the network and access whatever DSP and I/O resources are required. System setup for regularly repeated yet complex tasks is rendered trivial. A network-based system allows an audio production to be configured and/or controlled from a remote location with a browser application running on any computer or similar compatible device. For example, a major musical event can be fully line-checked on site using a tablet and subsequently mixed and produced in a studio hundreds of miles away. Stage Tec’s reputation for maximum reliability is fully enshrined in AVATUS: redundancy of Ethernet networking via both copper and optical interfaces is provided as well as dual power supplies and optional hardware redundancy.